The BBC screened adaptations of the 1920 play R.U.R. by Karel Čapek in 1938 & 1948. 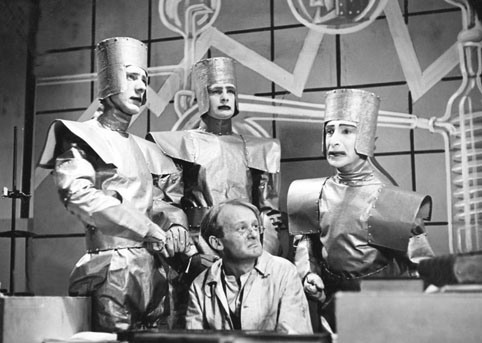 The word ‘robot’ was originally coined in this play. Doctor Who may well be the longest-running science-fiction television series in the UK, having been broadcast for 33 seasons since 1963, but it wasn’t the first science-fiction programme. That distinction belongs to a 35-minute abridged adaptation of a 1920 play by the Czech writer Karel Čapek, called R.U.R. (sub-titled Rossum’s Universal Robots) which presents a world which first exploits its new servile creations, robots, and is then dominated by them. It was produced by the BBC on 11 February 1938, and it is the first known piece of television science fiction anywhere in the world. A full ninety-minute live production of R U R was produced on 4 March 1948. 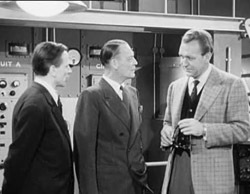 In the summer of 1953, BBC staff writer Nigel Kneale created, together with director and producer Rudolph Cartier, the six-part serial The Quatermass Experiment, the first of several Quatermass serials. It was Britain’s first science fiction television programme aimed at an adult audience. Only the first two episodes were recorded, and these only as poor-quality tele-recordings. These are the oldest BBC recordings of any fictional series today. Note that as colour television was only introduced in the UK in July 1967, all programmes up to then were in black and white. 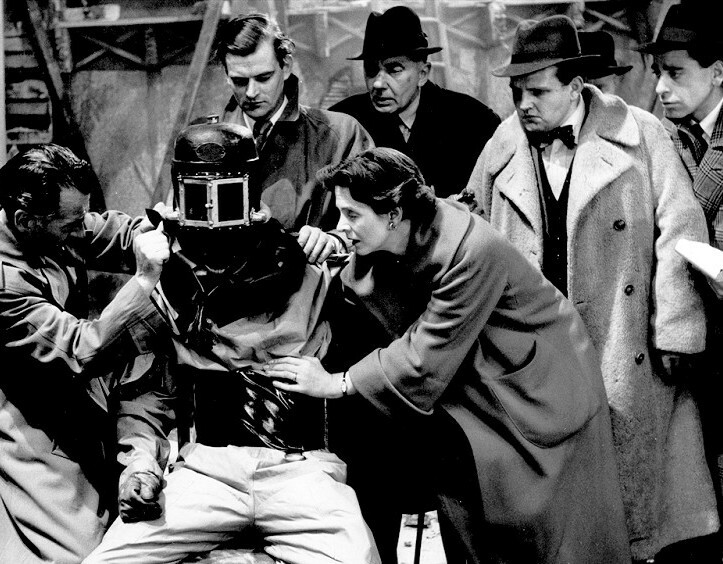 On 12 December 1954, a live adaptation of George Orwell’s Nineteen Eighty-Four, produced by the BBC’s Quatermass team, achieved the highest television ratings since the Coronation of Queen Elizabeth II in 1953. It was so controversial that it was debated in Parliament, and campaigners tried unsuccessfully to have the second performance the following Thursday banned. Britain’s first commercial television network, Independent Television, was launched in September 1955 as a competitor to the BBC. According to most buffs and compilers of TV history, commercial television’s first science-fiction serial was Pathfinders In Space, produced by ABC, a network licensee, in 1960. This was followed by the sequels Pathfinders to Mars (1960) and Pathfinders to Venus (1961). However this was not the first. Several science-fiction serials were in fact produced not long after the launch of commercial television, but if any recordings of them were made, they have been lost. 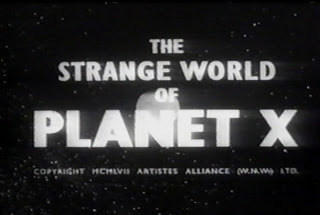 In September 1956, ATV (Associated Television), the licensee for London weekend television, produced The Strange World of Planet X, shown in six 25-minute episodes as part of its Saturday Serial anthology series. Scientists discover a formula giving access to the fourth dimension – the unification of time and space – and, with others, are transported to the abstractly arid Planet X. It presented the fairly cerebral concept of the fourth dimension and time travel in an engrossing way that held the attention of audiences for nearly two months on the fledgling network, this at a time when there were only a relatively small number of television sets in England. I can remember watching the programme and feeling scared as the scientists stared through a screen into a dark experimental chamber where some frightening transformation was taking place. The studio-filmed programme had a distinguished cast lead by Helen Cherry (photo) and William Lucas (photo) (who had been in a science-fiction Hammer film, X the Unknown, released slightly later in November 1956). The other actors were Maudie Edwards (photo), David Garth (photo), and Paul Hardtmuth (photo). The script was written by actress-turned-writer Rene Ray, and the programme was co-directed by Quentin Lawrence and Arthur Lane. The episodes were screened on Saturday evening from 15th September 1956 to 20th October 1956. Episode 1 was titled The Formula; Episode 2: The Terrible Cabinet; Episode 3: The Unholy Threshold; and Episode 4: The Dimension Discovered. The titles of episodes five and six are not known. All episodes are believed to be lost or were wiped after screening, and there are not any stills. Even if they had survived, archives were often destroyed when TV companies merged or went out of business. 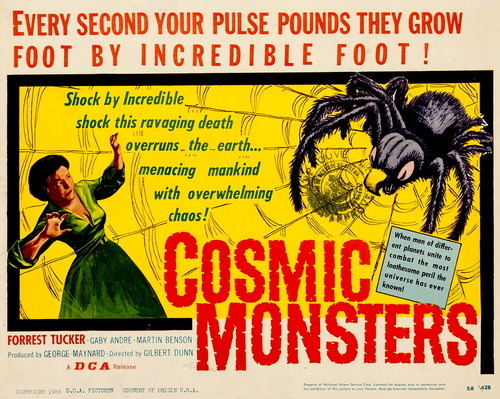 The following year, 1957, Ray turned her own screenplay into a novel of the same name, though the plot was changed significantly with a mono-maniacal scientist inventing ultra-sensitive magnetic fields; insects and spiders starting to mutate into giant monsters; and an alien spaceship appearing over London and warning mankind against the dangers of the experiment. Brig. General Cartwright: There’s no one else available to operate this computer of yours. Dr. Laird: But a … woman? This is preposterous. This is highly skilled work! On 15 December 1956, ATV followed The Strange World of Planet X in its Saturday Serial slot with another six-part programme, The Trollenberg Terror. The story starts in the Swiss mountain village of Trollenberg with climbers mysteriously disappearing in the mountains, and a stationary radioactive cloud appearing. The serial was written, according to one source, by a team of three writers, Giles Cooper, Jack Cross, and George Kerr (collectively credited as Peter Key) and directed by Quentin Lawrence, who went on to make a film version of the same name in 1958. The American version was called The Crawling Eye.